The waters of Convict Lake reflect the eastern side of the Sierra Nevada Range south of Mammoth Lakes, California. This entry was posted on Monday, May 19th, 2014 at 5:16 am. 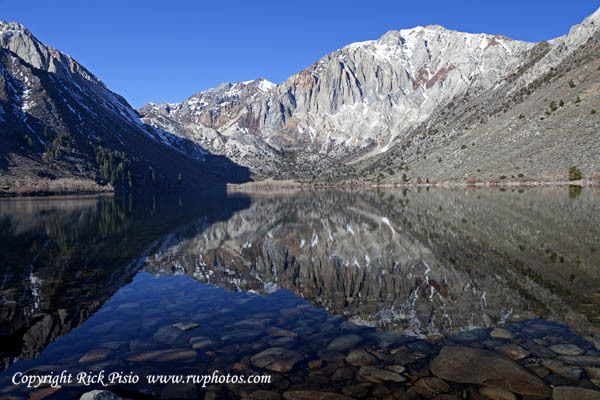 It is filed under Landscape, New Images and tagged with blue sky, lake, landscape, mammoth lakes, mountain, mountain lake, reflection, rocks, sierra, sierra nevada, sierra nevada range, sky, tranquil, water. You can follow any responses to this entry through the RSS 2.0 feed.